Precious metals expert Michael Ballanger believes silver is poised for a "massive move to the upside." Would it be that a picture is worth a thousand words? In the case of the graphics posted below, in a word, yes! Look at the positioning of the mighty Commercial Traders, who rarely lose money and who operate under the blinded eye of regulatory oversight and governmental sanctuary. 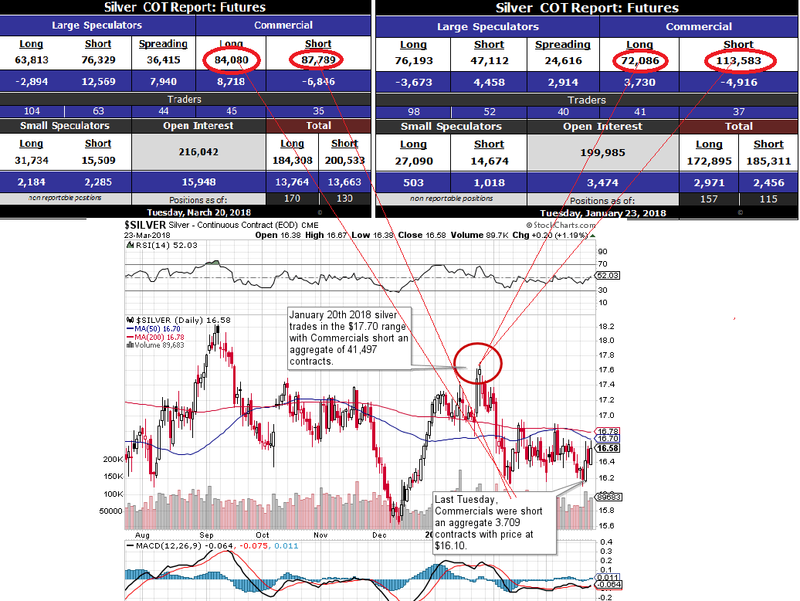 As of last Tuesday, the most powerful group of traders ever to operate under the watchful eye of the Working Group on Capital Market wiggled out of a massive 41,497-contract short position in silver on January 23, and arrived in full regalia this week short a mere 3,709 contracts. 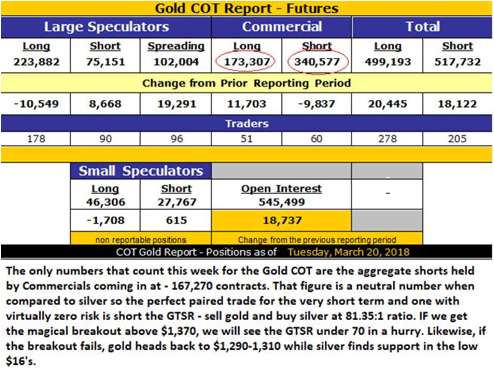 To provide some modicum of perspective, the Commercials were short a notional amount of silver that would correspond to 207,485,000 ounces worth $3.3 billion at the $16.20 per ounce benchmark on January 23, and are now short a notional 18,545,000 ounces worth a paltry $300,429,000. In other words, the Commercials covered $3 billion worth of fantasy-land silver shorts in a mere eight weeks, which represented nearly 25% of world silver production in 2017 (885.8 million ounces). But don't let your emotional extremities get twisted into a tangled knot of outrage and indignation. We have seen this movie all too often before, and the only reaction worthy of note is to go out and buy silver with both fists. Are any of you actually looking at this? Or are you all simply content to count your wealth and tell war stories from the past? The silver market is—right now—exactly where it was in 2001. It is absolutely primed for a massive move to the upside, and while it underperformed gold on Friday and is still worth less than 1/80 its price, the behavior of the Commercial Traders confirms an impending, if not unexpected, thrashing of large speculators in the near future, and sets up an decent trading opportunity for all of us. I now have 60% positions bought in the SLV April $14, calls and am looking for a move through $17 to confirm the validity of the trade (and add the remaining 40%). As for gold, while the COT structure is less than compelling relative to silver, gold's tape action is simply superb, thrice rejecting downside probes beneath $1,310 and now solidly approaching the magical $1,360-1,370 resistance zone. 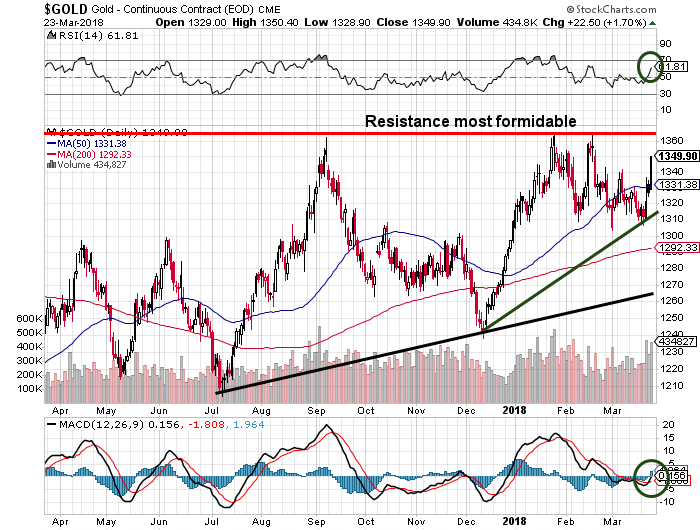 I will refrain from going off on yet another tirade against trusting "technical breakouts" for gold and silver, but what I will be doing is watching the Commercials like a hawk if, as, and when gold probes that upper resistance zone, which remains most formidable and has for years. Gold almost touched $1,400 back in 2014, but each test since has been rejected at $1,360-1,370. While I am a cynic in trading bullish breakouts, I suspect that, as I wrote back in January, something did indeed change in the December-January rally. I think that statement will be borne out with a successful assault on $1,400, followed by the surpassing of that ominous 2013 breakdown level of $1,525 later in 2018. My beloved Gold Miners ETFs, both Junior (GDXJ/JNUG) and Senior (GDX/NUGT), are lagging badly, with the HUI caught in the 175-180 level. This is because, despite the underlying commodity they produce, develop, and explore for, they are still "stocks," and when margin calls arrive because your CryptoScam junior just broke the $3 marginable level and has gone "no bid," you thank your lucky stars for that 1,000 shares of a gold producer that can be quickly sold to meet the margin clerk's demands. I am adding to physical positions in the precious metals, and speculating with calls on GLD and SLV because, quite honestly, the current state of global stock markets reminds me of September 1987. I am terrified that the gold miners will, as in October 1987, get thrown out with the bathwater if a bona fide crash takes hold. That old expression about what happens to the innocent piano player when the police raid the brothel is a keynote thought when reviewing portfolios this weekend. 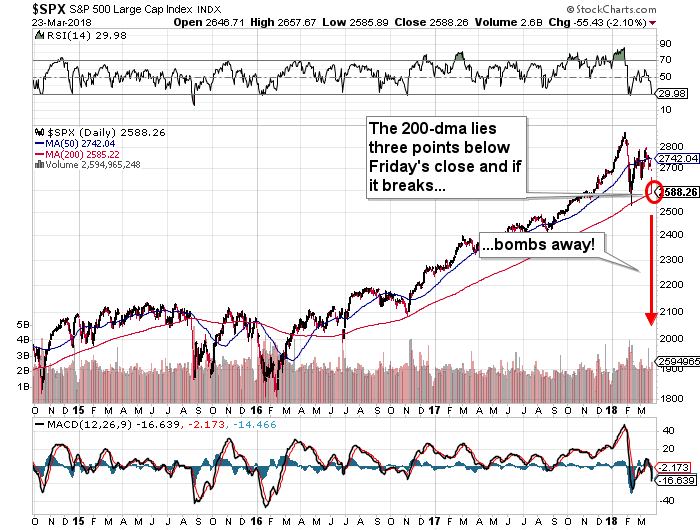 The S&P closed three points from its 200-dma (daily moving average) Friday, and I shudder to think what will happen if it gives next week. I urge everyone to be on their toes. These are not the times to try to be heroic; capital preservation comes first.